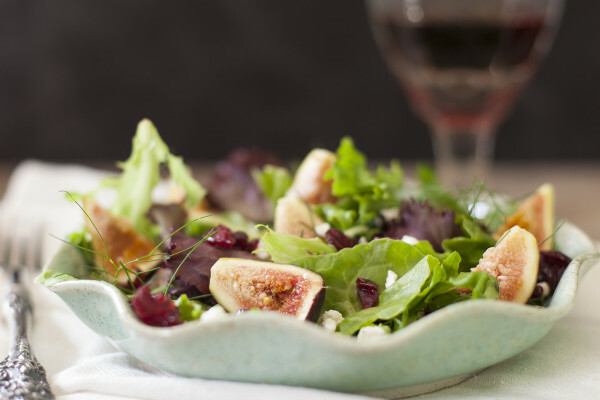 Figs are one of the culinary joys of summer. Fresh figs are SO seasonal that, at least in Washington, you never see them any other time of year. The first time I see them in the grocery store or at the market each year, I literally squeal with delight exclaiming, “Figs! Oh Figs!” causing several shoppers to stare me suspiciously as if to tell me they know that I’m really cursing. But, if I’m somewhere other than my local grocer stores, other food lovers will inevitably hear my happy shouts and, like moths to a flame, gather ’round to examine the tender fruit with me. Because figs are so delicate, unless you have your own fig tree (yes, it’s on my wishlist! ), I find it’s difficult to get perfectly plump, juicy, squishy figs. When I do find some, I savor them, and then end up going another 11 months not really thinking about them until they surprise me again the following year. I kind of feel like I’m in a similar sort of strange head space with grieving the loss of my grandmother. I planned the memorial, worked on an incredible video biography of her life, shared through my tears at her service about our special relationship and the important life lessons she taught me. I cried a lot. But a couple days after her memorial, it all kind of went away. When my grandfather passed away last year, I continued grieving for weeks after his death. I went through a really healthy grieving process and came out the other side. But right now it seems as though I’ve kind of stopped thinking about losing her, but (like the figs) in a number of weeks or months it will suddenly surprise me again. I feel almost like I’ve regressed in the stages of grief and am smack dab in the middle of denial. Perhaps it’s because I never had a chance for denial this time around. We immediately went to the hospital and were there with her as she breathed her last. Or perhaps it’s because I’m a mom now and times I wanted to fall apart I couldn’t because my little one needed me. Whatever the cause, I feel like I’m waiting with baited breath for the hurt to come back bigger and deeper than ever. But maybe I’m reading this all wrong. I did cry, and I did mourn, and perhaps this just needs to happen in stages. Maybe I’m right where I need to be right now, happy and enjoying motherhood. Maybe grief will surprise me again later, but softer and more gently than I’m expecting. A reminder when I see her photo, or push aside her African dress in my closet. I guess I won’t know until it happens, so I’m making a choice. I choose to embrace my feelings. Right now, I am truly happy. I’m enjoying my son and my husband, I’m enjoying recipe writing and food photography. I’m even enjoying organizing my house! If grief returns, I’ll embrace it as well, because it exists for a reason. For now, I savor the figs. Spread your greens out on a plate and nestle the fig quarters in the lettuce. Sprinkle the salad with the cranberries, pine nuts, fennel fronds, and goat cheese. In a small bowl, whisk together the lemon juice, olive oil, honey, salt and pepper. 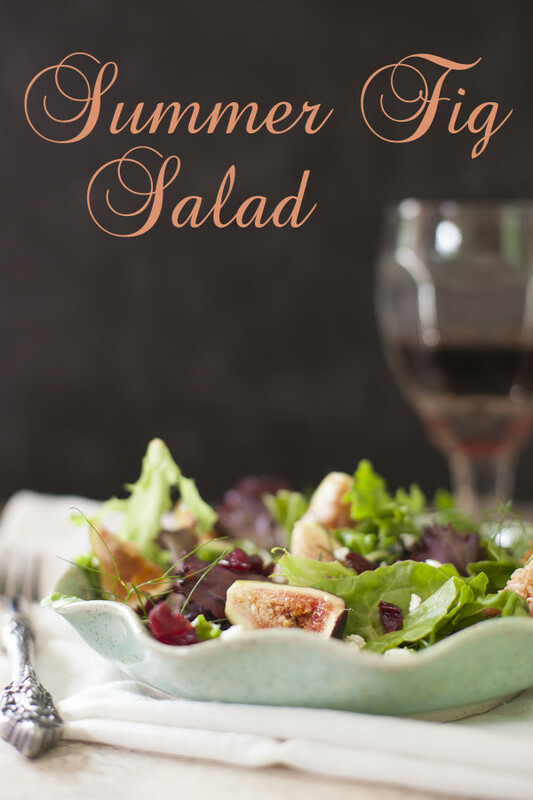 Drizzle the dressing over the salad. Approximate cost/serving: Figs are a little pricey so this is probably the most expensive salad I’ve ever made. But it’s worth it, and much cheaper to make your own than to order it in a restaurant. I grow my own fennel, so the fronds don’t cost me anything, but if you buy fennel to make another fennel recipe, just save a few fronds for this salad. It ended up costing me about $4.50 for the salad. Pretty good deal for such a fancy lunch! Vegetarian/Gluten Free: This is both, and you can make it vegan by omitting the goat cheese.